KYIV, Ukraine—Forget death and taxes. 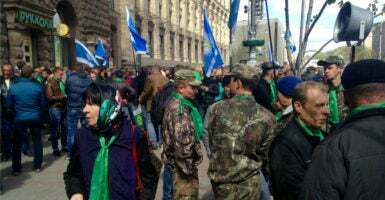 In Ukraine, nothing is certain but war and protests. In the country’s eastern Donbas region, the war against Russia and its separatist proxies has dragged on for three years. And in Kyiv’s government halls, meaningful anti-corruption reforms are advancing at a snail’s pace more than three years after the revolution. The clock is ticking, some say, before the undercurrents of discontent that sparked the 2014 revolution resurface. “The steam is building up and when it is enough, one little issue and people will hit the streets,” Myron Spolsky, deputy head of Ukrainian Plast Organizations, told The Daily Signal. Plast is the National Scout Organization of Ukraine. Overall, the national mood in Ukraine is pessimistic. The war could, at any time, spiral into something much worse. Yet, the majority of Ukrainians remain staunchly opposed to political concessions with Russia for the sake of peace. “People want peace, but not at any cost,” Iryna Bekeshkina, director of the Democratic Initiatives Foundation, a Ukrainian think tank, said during a presentation in Brussels on Tuesday, according to Ukrainian news reports. According to a December 2016 poll by the Democratic Initiatives Foundation, only 20 percent of Ukrainians surveyed support “peace at any price” in the ongoing military conflict with Russia and its separatist proxies. “We must understand that if the government of Ukraine, although I cannot imagine this, is forced to accept peace on Russia’s terms … these conditions will not be acceptable to the parliament because they are not supported by society,” Bekeshkina said. On the home front, the majority of Ukrainians have lost faith in their post-revolution government, and feel as if the country is moving in the wrong direction. According to a separate December 2016 poll by the Democratic Initiatives Foundation, 73 percent of Ukrainians surveyed said their lives became worse in 2016; 67 percent said the country was moving in the wrong direction. 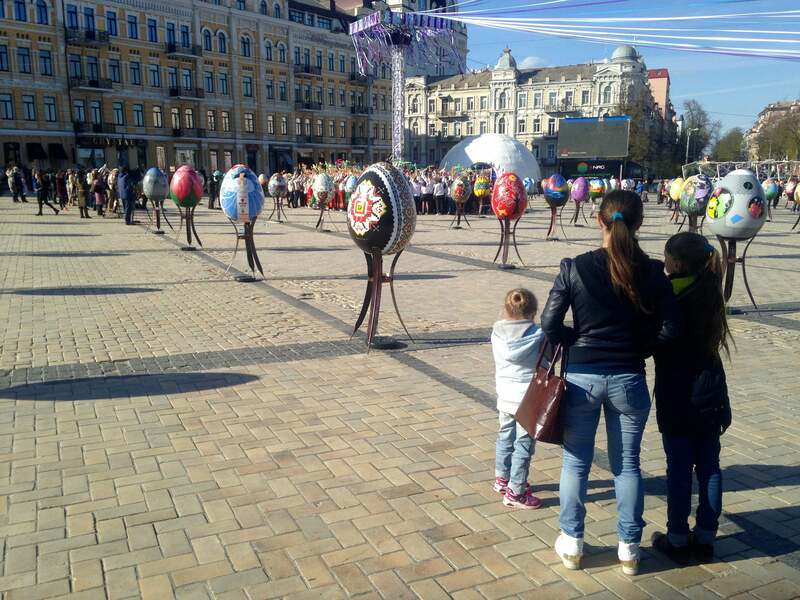 As part of Easter celebrations, a formation of giant, decorated eggs stands in St. Sophia’s Square in central Kyiv. On Wednesday afternoon, beneath the golden cupolas of St. Sophia’s Cathedral, children performed a synchronized dance while admirers weaved through the holiday display. Meanwhile, 500 meters away (about one-third of a mile) down the street that adjoins St. Sophia’s Square, a group of police in riot gear stood in a shoulder-to-shoulder formation in front of a Russian bank. 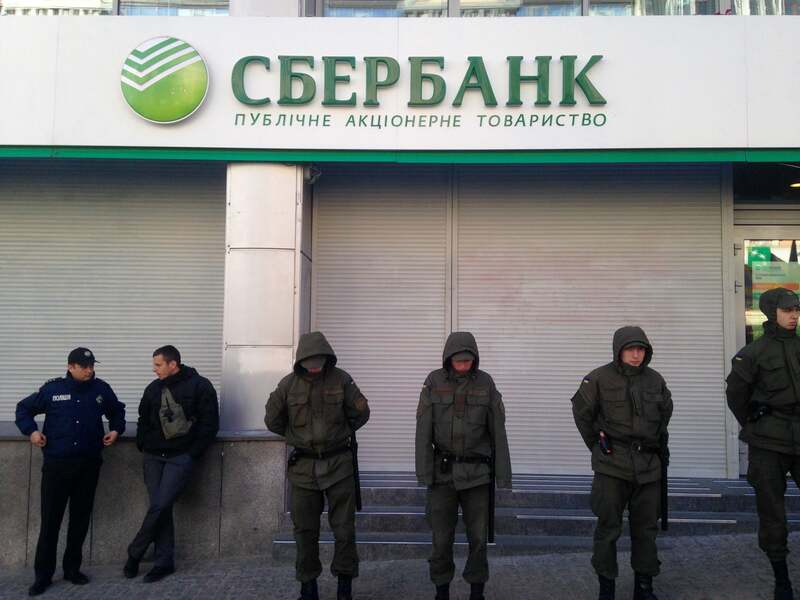 On March 13, protesters stacked cinder blocks and sandbags, and laid barbed wire to seal off the Volodymyrska Street branch of the Russian state-owned Sberbank. The police deployed on Monday to guard the immured bank from further damage. On Wednesday, the riot police stood face to face with an encampment of about 50 protesters, most of whom belonged to National Corpus, a political offshoot of the Azov Battalion paramilitary unit. In 2015, the Azov Battalion was incorporated as a regiment in Ukraine’s National Guard. Protesters and riot police remain in a standoff since Monday outside a central Kyiv branch of Russian state-owned Sberbank. Protesters said they were opposed to Russia’s continued influence in Ukraine’s economy and politics. Sberbank, in fact, falls under both the U.S. and EU sanctions regimes placed on Russia for its military actions in Ukraine. It is, therefore, an affront to many Ukrainians that the bank is still allowed to operate in Ukraine. Ukraine and Russia have fought a conflict for three years, yet Russia remains Ukraine’s No. 1 trading partner and top foreign investor. A little more than 1 mile from the immured Sberbank branch, across the Maidan and up a steep hill, armed riot police patrolled through Mariinsky Park on Wednesday, as they do almost every day. They stood watch over the periphery of Ukraine’s parliament building, the Verkhovna Rada. These days, it is not unusual to observe armed police or soldiers patrolling through European capitals with weapons drawn. In Paris, armed platoons of army soldiers weave among tourists outside landmarks such as the Louvre and the Eiffel Tower. In Paris, however, those patrols are a defense and a deterrent against terrorism. In Ukraine, they are a sign of simmering domestic unrest. On the Verkhovna Rada’s marble steps a metal barricade is in place. A line of buses with tinted windows is parked nearby. Within them are dozens of riot police in body armor and with gas masks affixed to their waist belts. Here, on the marble steps of Ukraine’s parliament during a protest in August 2015, a hand grenade tossed by a Ukrainian war veteran killed a police officer. The protest on that day was in opposition to a parliamentary measure to give the Russian-backed separatist territories in the Donbas a degree of autonomy and a vote in parliament—a step toward fulfilling some of the concessions demanded by Russia as part of the 2015 cease-fire. Two years later, riot police are still camped out in front of the parliament building. And the war still hasn’t ended. A notorious symptom of Ukraine’s endemic corruption is the dire state of the country’s roadways. If one braves the potholes, however, and travels east from Kyiv, clues to the war begin to mount. You pass through a network of roadblocks and checkpoints, manned by both police and military personnel. The closer you get to the war zone, the more frequent the stops become. Eventually, about 400 miles southeast of Kyiv, you reach the end of the line at the edge of the war zone. There, you will find a 250-mile-long network of trenches, fortified outposts, and, at some places, an ill-defined no man’s land between embattled, artillery-razed villages. Artillery bombardments, mortars, rocket attacks, and small arms gunfights still occur daily at some front-line hot spots like the embattled towns of Avdiivka and Marinka. For those living within its reach, war has become a way of life. Children still go to school in Marinka and Avdiivka, despite the daily shelling. During the day in the center of Marinka, there is an open-air flea market in a parking lot. While nearby, construction workers repair artillery damage to an apartment building. But at night, when the war typically flares up according to its diurnal rhythm, people stay inside, and the streets are empty. On Wednesday, the towns of Marinka and Avdiivka were both targeted by 82 mm mortar fire, the Ukrainian military reported. Also on Wednesday, according to military reports, one Ukrainian soldier was killed during a mortar attack on the Butivka coal mine near Donetsk, and five soldiers were wounded at other places along the front lines during 45 separate attacks. For now, a political solution to the war in Ukraine remains at an impasse. For years, the Kremlin has pushed Kyiv to accept the separatist republics as semi-autonomous territories, which would have voting rights in Ukraine’s parliament. Also, as part of the February 2015 cease-fire deal that Russia brokered in the Belarusian capital of Minsk, Ukraine is supposed to adopt a constitutional amendment to decentralize power away from Kyiv. In Kyiv, lawmakers resist changing Ukraine’s Constitution to secure a peace deal. They say that fulfilling Moscow’s demands would be tantamount to giving Russia a vote in Ukraine’s domestic affairs. Ukrainian lawmakers say free and fair elections in the separatist territories are not possible until Moscow withdraws its troops and Ukraine regains total control of its border with Russia in the Donbas. 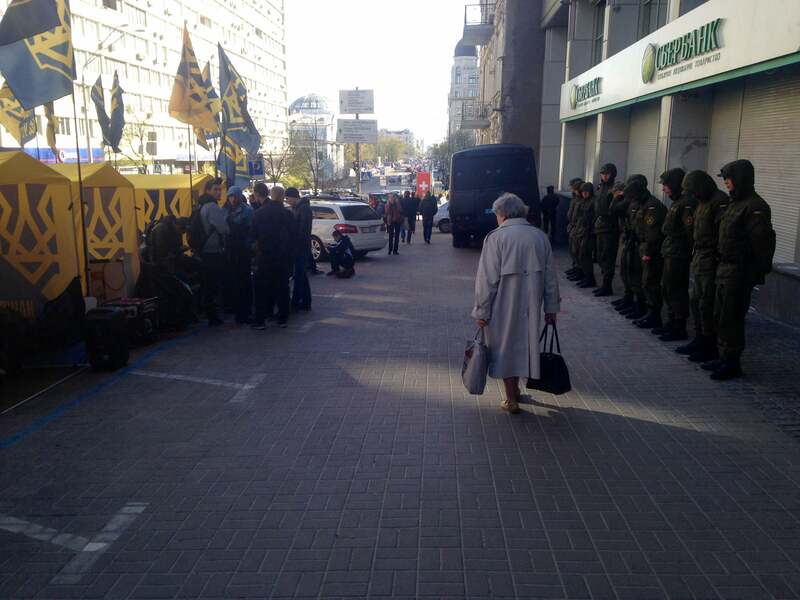 Ukrainian police on guard in front of a Russian bank in central Kyiv. Ukrainian President Petro Poroshenko has called the withdrawal of Russian troops and Ukrainian control of the border his “red lines” to any further peace negotiations. If Kyiv backs down from the conflict and gives into Russia’s demands, it could ignite violent domestic unrest at the hands of disaffected political activists, military veterans, and active-duty troops, who say they have paid too high a price to accept anything other than unconditional Ukrainian control over the separatist territories. According to a Feb. 20 report by the Democratic Initiatives Foundation, 71 percent of Ukrainians are opposed to elections in the Donbas. Russia, for its part, denies that Russian troops are operating in Ukraine and insists that a peaceful end to the conflict cannot be reached until Ukraine adopts the constitutional amendment to decentralize power and allows elections in the Donbas. The U.S. and the EU currently maintain sanctions against Russia for its 2014 seizure of Ukraine’s Crimean Peninsula as well as for Russia’s continued proxy war in eastern Ukraine. Officials in Kyiv consider maintaining those sanctions a top priority. Ukrainian officials took note on Wednesday, when, during a frosty visit to Moscow, U.S. Secretary of State Rex Tillerson showed no signs of wavering on the sanctions regime put in place in 2014 against Russia. “Until full progress is made on the Minsk accords, the situation in Ukraine will remain an obstacle to improvement in relations between the U.S. and Russia,” Tillerson said during a joint press conference with Russian Minister of Foreign Affairs Sergey Lavrov.